My only criticism of the above design is that a single Cat6a cable could take the place of both the coaxial TV cable and speaker line, and possibly a DC power line as well (if used with the proper Power over Ethernet equipment). Then you could get power, sound, video, and anything else that can be encoded as binary data via a single line. Of course, once you start seeing places to put data cables, they start appearing everywhere. For example in this shot there is a drainage pipe coming down from a nearby wall to near where a conduit bend is. 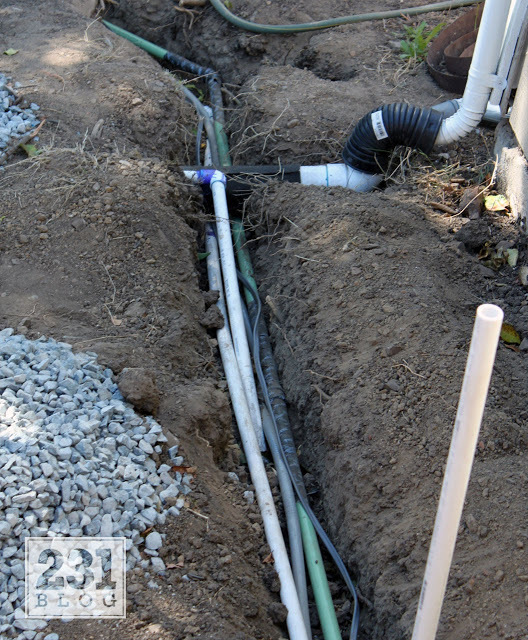 A fiber or low power data cable could safely run through this and other nearby drainage lines, perhaps up to a rooftop spot suitable for a WiFi router. 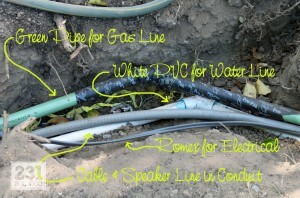 Most data cables are water proof, and some are even rated as fire resistant. 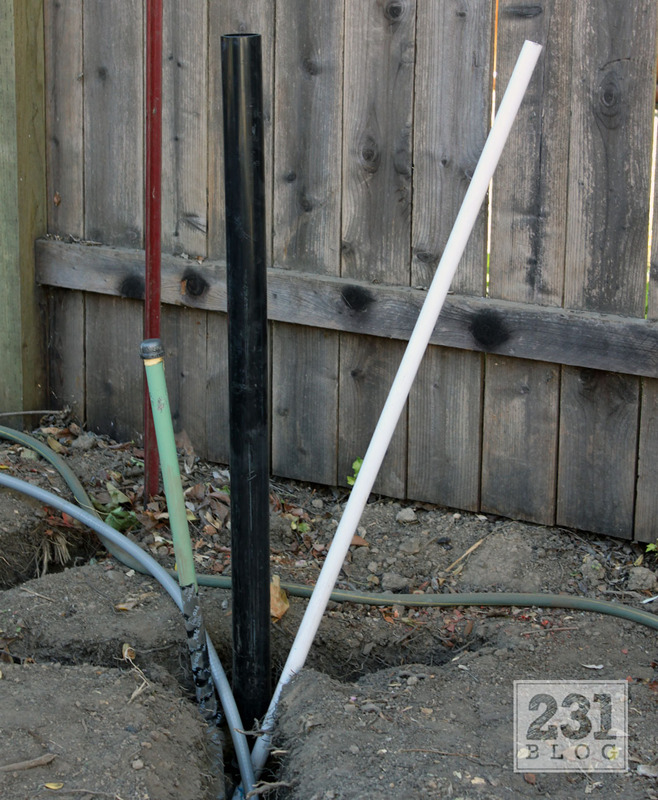 Most people see a simple vertical conduit where the pipes come out of the floor (and eventually into the desired outdoor appliances). I immediately see another potential place to install data cable conduit: along the fence in the background, perhaps underneath the wood beam running horizontally across the vertical slats. 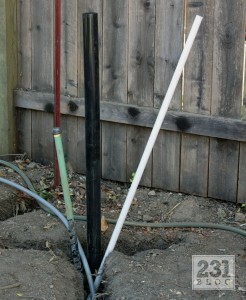 A conduit or flexible outdoor rated line could be hidden below eyesight on there easily. 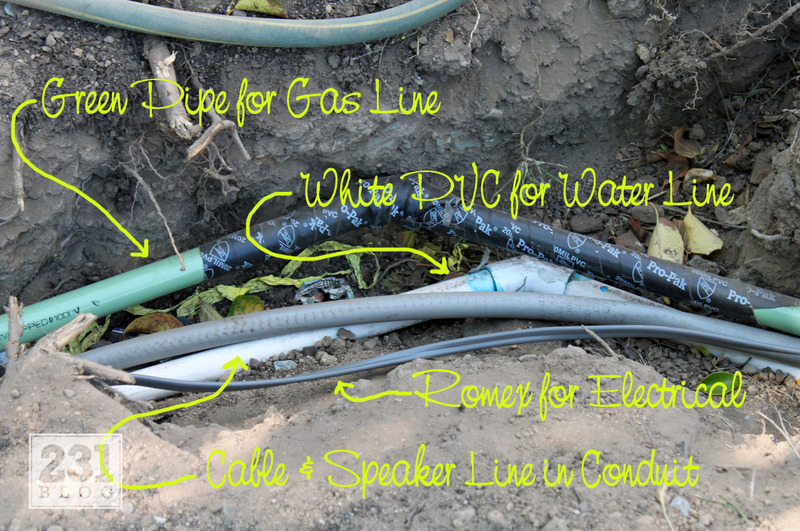 Wires or conduit could also be run under and over the fence, connected out to all the neighbors. Now that’s where data roads, shares networks, and do-it-yourself attitudes all come together. The concept behind the name Data Roads Foundation is based on the claim by Internet pioneers Vint Cerf and Bob Kahn that the Internet Protocols (IP) they created are just “the rules of the road”. Thanks to modern network equipment, that means you can build a private data roads network in your backyard fairly cheaply. Once you connect routers (the smart intersections of data roads) at the corners to your neighbors’ private roads systems, then you have a connected community roads system for your data to travel farther. If you can manage to get connections across streets and easements, your private roads network suddenly has connections out to even farther neighborhoods, perhaps eventually out through your entire city. Shares networks can involve lending and borrowing any kind of thing, real or digital. You can set up a shares network with your friends and neighbors right now, sharing things like shovels and plumbing tools. Digital networks just give you a much easier way to track what is being shared, so that everyone is following the sharing rules and being fair about it. If you lend your neighbor a shovel and forget about it, software can automatically remind you that she has it, and message her that you need it back for your own trench digging project. The digital network pieces can be shared too, such as unused computational time sharing for computationally intensive tasks, or unused storage sharing for temporary high-storage applications (like security camera video processing). Now to get really recursive about it, you could use any existing sharing network infrastructure to borrow all the tools required, to dig the trenches, and install fence conduit, to build even more sharing network infrastructure! Growing the shares network to more friends and neighbors gets more cost effective the longer it goes on, and on. Even if you don’t like DIY projects, you can hire handy-people at much more competitive prices than your local ISP duopoly will ever provide. That means the installation prices should drop and new installs get easier every time. Doesn’t that sound like a nice change from your Internet access and maintenance bills going up every year? Data Roads Foundation is helping with a pilot project called Northeast Los Angeles Shares Network (or NELA-Shares.Net for short, which nicely matches their web site domain name). One of our many goals with this project is to establish a model for cooperative member-owned sharing networks that every community can emulate, first in the USA, then globally. Data roads channels and intersections will definitely be among the things we will encourage home and landowners to build and share with each other, but these mesh network technologies will enable far more forms of sharing as well. If you live in the Northeast LA (NELA) region, sign up for membership using their cooperative’s new form. You will notice our nonprofit’s logo on their form, because we are helping them with bank transfers until they can get all their incorporation paperwork submitted, so they can get their own bank accounts set up for cooperative operations. If you don’t live in the NELA region, please start talking to your local friends and neighbors about setting up your own community shares network. The digital and physical sharers, do-it-yourselfers, and collective buyers in your community will all thank you for starting the sharing!